Home > 2015 NFR Stuff by Montana Silversmiths > NFR Silver Cast Buckle FINAL CLOSE-OUT PRICE! 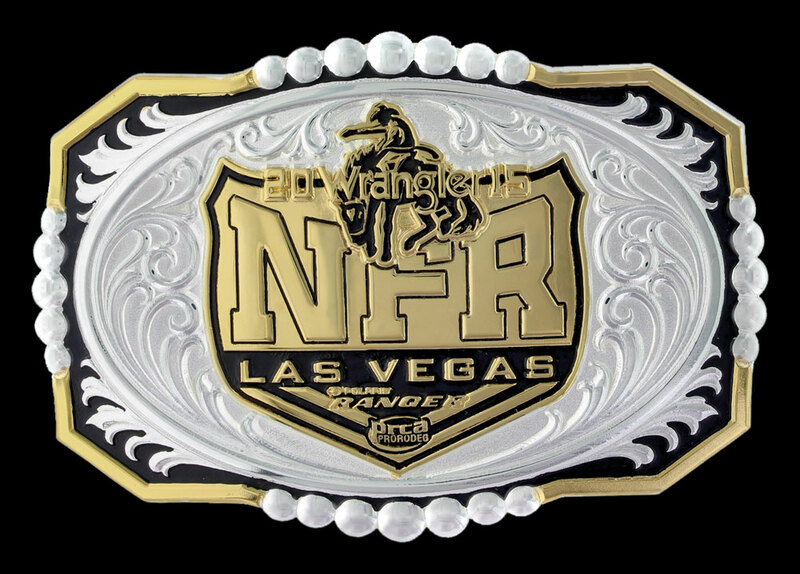 NFR Silver Cast Buckle by Montana Silversmiths. This scallop shaped Attitude buckle is solid cast, featuring a gold finish 2015 NFR Wrangler Ranger logo set within an oval of bright silver finish with vine flourishes against a black background. A set of silver finish high domed beads decorate each side of this buckle alternating with a gold finish smooth wire-like edging. Approximately 2 3/4" x 4". Standard 1.5" belt swivel. All orders processed within 48 hours. Please allow 7 business days to ship.